With the local food movement gaining ground, what could be more local than your own back yard or balcony? Growing your own fruits and vegetables is a great way to get back in touch with nature, at the same time providing for you and yours. Green Promise details the hidden dangers of conventional versus organic gardening. In today’s fast-paced consumer society, the demand for hassle-free items with minimal effort reigns supreme. When it comes to fruit and vegetables, what could be easier than supermarket produce? Unfortunately, today’s busy schedules have weeded out backyard gardening. Take a visual survey of your own neighborhood and undoubtedly you will find more yards filled with grass and playthings than vegetable gardens or fruit trees. And for many who do garden, there is little time for maintenance, which is why typical gardens often include an arsenal of quick fixes that don’t take the long-term effects into consideration. Whether you are just getting started or already have a patch to call your own, choosing what to grow and how you grow it are important decisions. We’ll use a tomato plant as an example and consider the hidden dangers associated with conventional gardening from getting that plant from your local nursery, all the way through harvesting fresh juicy tomatoes for the table. First off, where did that tomato plant come from? If it is not an organic or heirloom variety, is it genetically modified? There’s simply no way to tell. We do know it was grown from seed and, through recent mergers, Monsanto owns and controls the vast majority of all fresh market tomato seed. That puts the likeliness of a GMO tomato plant very high, if not now, then in the near future. 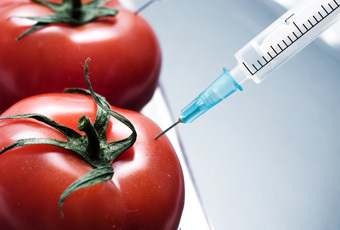 It is no secret that Monsanto is a big proponent of tinkering with the very DNA of our food. What’s all the fuss if our very own FDA claims it to be safe? The plain truth is that we simply don’t know. When we consume GMO food, we submit ourselves as test subjects in perhaps one of the largest science experiments on the planet. Plus, there is no telling what has been added to the plant…even animal DNA gets used! With any luck you will find an heirloom plant. What exactly is an heirloom plant? The generally accepted definition is a plant grown from a single variety of seed dating back 50 years or more. That means the seeds have not been cross pollinated with other plant species to produce hybrid plants and guarantees there has been no lab tinkering with the plant’s DNA. There are seeds whose roots can be traced back to early civilization! But has it been raised organically? Unless it is labeled as such, it’s a good bet the parent plant was raised chemically and the resulting seedling also shared the same fate. It’s still a better choice than that mystery plant, but an organic heirloom plant is the Holy Grail of the garden. Now that you’ve chosen your plant, it’s time to get it into the ground. Conventional wisdom would have you tear up the soil with a tiller and put down plastic weed barrier all over the place. Believe it or not, according to Lee Reich, author of Weedless Gardening, that is the worst thing you could do. First off, you would be destroying the soil’s intricate layering and creating what amounts to a giant dirt sponge where all the water you supply quickly pools at the bottom-most layer, far from the reach of your tomato’s roots. And putting down a plastic weed barrier will slow down some of your weed problems, while at the same time leaching chemicals into your soil where your tomato will happily drink them up and deposit them into those lovely developing tomatoes. Mystery plant … check. Soil havoc … wreaked. Synthetic plant food … delivered. Weeds and bugs … annihilated. It’s harvest time — have a little tomato with your toxins, possibly tossing in some mystery DNA on the side. So you’ve tilled your soil (inadvertently bringing a host of buried weed seeds up from the depths), put down your plastic (trapping in moisture and heat which will really boost your overall mold production) and set your mystery tomato plant into the ground. It’s feeding time for your tomato. What does conventional gardening tell you to do? Reach for that miraculous synthetic fertilizer to jumpstart your plant’s growth. Unfortunately, doing so takes its toll on the planet’s resources. According to dirtdoctor.com, synthetic fertilizer production relies on petroleum, not a sustainable practice by any means. Plus, the major component of synthetic fertilizers is fixed nitrogen in the form of nitrates. Unfortunately, pumping nitrates into the soil faster than the plants can absorb it leaves the excess to enter into the groundwater, making its way into rivers and streams. Abundant nitrates in the water contributes to excess algae bloom. As algae decomposes, oxygen in the water is consumed. Eventual oxygen depletion drives away all aquatic life. This contributed to the dead zone in the Gulf of Mexico. In addition to affecting water, oxidized forms of nitrogen are released into the air when applying fertilizer, contributing to breathing problems if inhaled and greenhouse gases as the they make their way into the atmosphere. Those same nitrogen oxides in the atmosphere contribute to the formation of acid rain, which changes water pH levels (dealing those poor aquatic creatures another blow) and leaches nutrients from the soil (counter to the goal of fertilization in the first place). Organic fertilizers are the safer choice here, ranging in a multitude of flavors from glacial rock dust to sea minerals, organic compost to natural palletized fertilizers. Fast forward a few weeks and you notice, despite your best efforts, weeds are popping up and are growing like gangbusters thanks to all that synthetic fertilizer. And what is gnawing on your tomato? It’s a space alien caterpillar from hell! What’s a conventional gardener to do? Pull out the heavy artillery, of course, and launch a full-on chemical assault on all who dare enter your hallowed patch. But before you do, know this: pesticides, herbicides and fungicides pose significant health risks, everything from skin irritation to nervous system disorders to cancer. While you are directly at risk from application, children and pets are even more susceptible. And don’t forget that the air and water will carry those chemicals to neighboring areas risking native plants, beneficial insects, fish, amphibians, small mammals, birds … right on up the food chain. Taking the time to pull or hoe weeds manually (and putting to practice the lessons from Weedless Gardening), companion planting, attracting beneficial insects and manually removing pests all are better options. Mystery plant … check. Soil havoc … wreaked. Synthetic plant food … delivered. Weeds and bugs … annihilated. It’s harvest time — have a little tomato with your toxins, possibly tossing in some mystery DNA on the side. Oh, and you better pile on some extra servings because studies now show conventionally grown fruit and vegetables have 40% fewer nutrients than organic produce. Bon appétit! There is a better way. Growing an organic garden is a start. Becoming somewhat of a land steward, as was done generations ago, is the next step. Watch for the next part in the series, which will discuss organic gardening in more detail. In the meantime, if you plan to grow any vegetables from seed, check out our organic vegetable seed list. Also scour your local seed racks as organic seeds are now sprouting up in stores and garden centers.